I have mentioned before that Boxycharm used to send out identical boxes to everyone (or perhaps a lipstick variation here or there); but, they are starting to expand and are now introducing bigger variations to their boxes - for example, this month you will receive an eyeshadow palette or setting spray, and a face mask or eye concealer. I have a feeling the variations will just keep growing. I have also heard that Boxycharm will potentially introduce an upgrade option in the Fall too. I know most people are excited about these changes - they aren't personally up my alley; but, I will explain more at the end of my post! 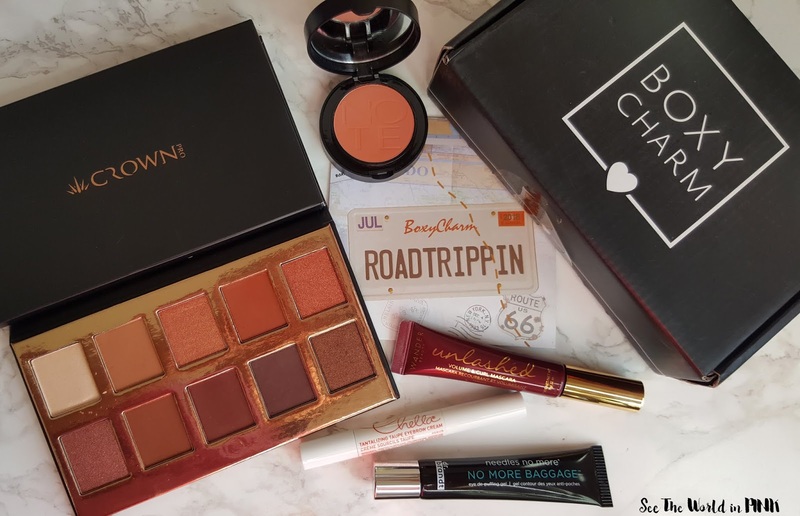 The theme of this month's box is called "Road Trippin". Also, I normally do a full face with all my products in my Boxycharm; but, this month didn't quite work for me. 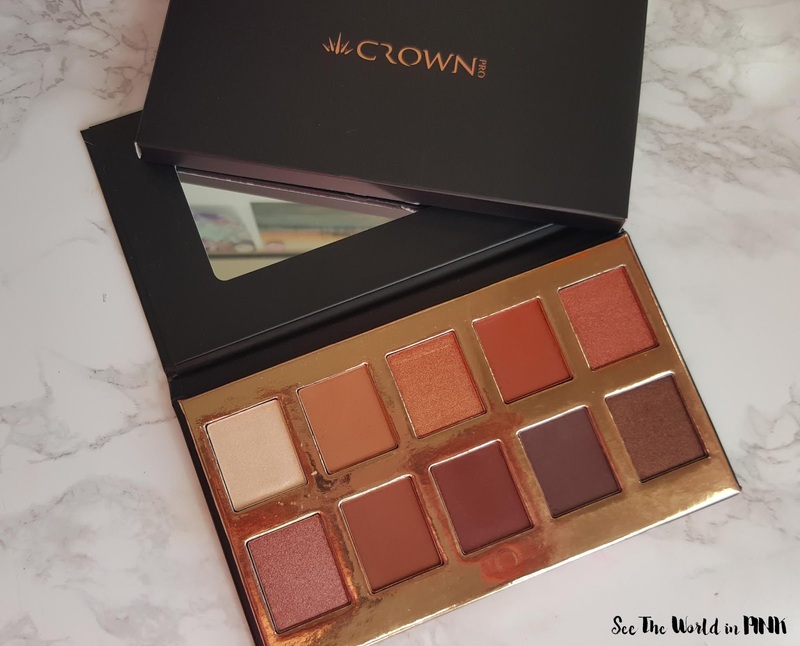 Crown Brush - Fuego Eyeshadow Palette ~ $29.99 US. Made up of rich warm-toned shades, this creamy, high-pigmented palette gives you exactly what you need to create infinite flawless eye looks. The 5 shimmer shades perfectly complement the 5 matte shades, making this the palette for all your glam #goals. This palette should be right up my alley - it is a warm, deep palette and it gives very Naked Heat vibes. But, since I own that palette this is a little redundant to me. I have heard good reviews on this palette for those that have tried it. This palette smells a little chemically to me and I just wasn't thrilled about it. This month, you could have received this or the Tarte Radiance Setting Spray and I think I just got my hope up that I would get that. 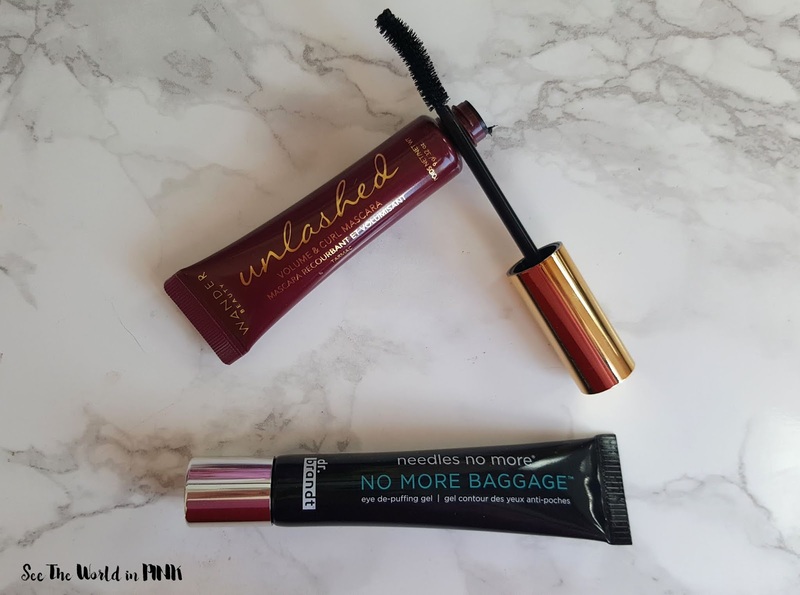 Wander Beauty Unlashed Volume and Curl Mascara ~ $29.00 CAN. An intensely glossy black mascara that volumizes, lengthens, and curls. This is one of the items in this box that I'm actually really excited to try! Wander Beauty is a new brand to me and this brush looks amazing! It is curled and the wand is really full and I can't wait to see what this does for my lashes! Dr. Brandt Skincare - Needles No More "No More Baggage" Eye De-puffing Gel ~ $53.00 CAN. A breakthrough under-eye solution that dramatically reduces the appearance of bags, puffiness, and dark circles for a more youthful and rested look. So this I think this is more so a thicker-peach concealer (from others reviews) and I just don't like those types of thick, goopy concealers under my eyes. I don't see myself using this - Dr. Brandt is a good skincare brand; but, this product isn't for me. You could have received this or a brand new Farmacy mask and I just wanted that mask so bad that I was not happy when I didn't get it in this box! Chella Beauty Tantalizing Taupe Eyebrow Cream ~ $26.00 US. Add some wow to your brows. This innovative eyebrow cream effortlessly defines and shapes your eyebrows with its creamy consistency, and built-in brush. The velvet-like formula makes blending easy, then sets, giving you perfect brows that will last all day and night. This is an interesting little package - I think it's a little hard to know how much product you are getting on the brush and harder to control. The brush looks good; but, I'm not sure I can make this taupe color work for me. I'm actually undecided whether or not I am going to try this. 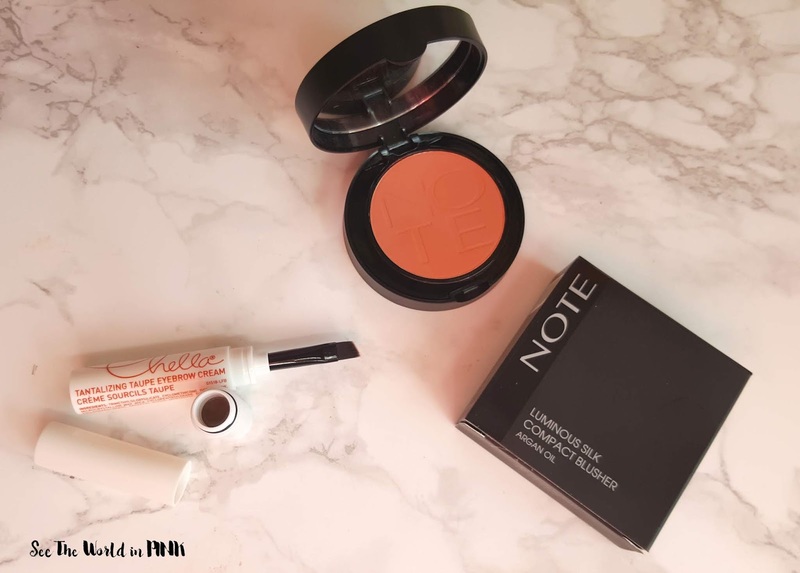 Note Cosmetics Luminous Silk Compact Blusher in Desert Rose ~ $16.50 CAN. With special active ingredients including argan oil to boost moisture levels in skin, this formula adds luminosity and cares for skin at the same time. I've never heard of this brand before; but, I like the look of this peachy blush! Other than the mascara, this is the other product I'm looking forward to trying to from this month's box! Boxycharm came with 6 products and a total value of $154.49 - there was a good variety of products in this box too. But, I will be totally honest and say that this box just didn't really do it for me. I am most excited about the mascara and blush. The eyebrow cream, palette and eye gel aren't really for me. 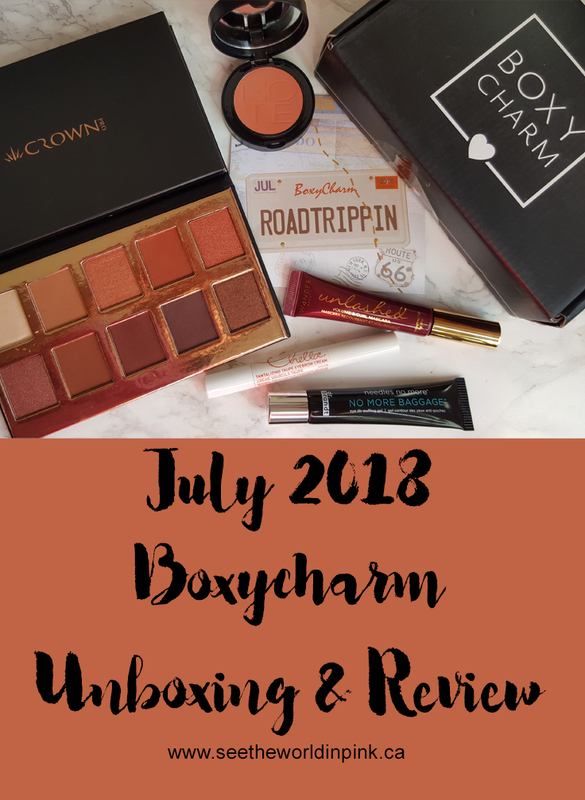 I know everyone else likes the idea of Boxycharm expanding and offering more products; but, I hate feeling jealous of what everyone else gets or really hoping for a product and not receiving it. I know the box is still worth it price wise; but, it starts to feel less worth it when you see others get a "better" box than you. I know it's just my frustration; but, that's the same feeling I had when I knew I was done with other subscription boxes as well.I have been subscribed to Boxy for over 2 years and have really loved it; but, I think I'm nearing the end with my subscription for now - this may be my last box. Or perhaps I will try out August and see how it goes. Either way, I will still be getting some sort of subscription box - I need a little present in the mail once per month! What did you think pf this month's box? And, what variation did you receive? I stopped my Boxycharm but I've been tempted to start it back. Last months box was really good but this month looks good as well. Last month's box was really good - I think I should have liked this box more than I did! I may give it one more month - it just works out to such a good deal, it's hard to unsubscribe!